We're up on Steam! 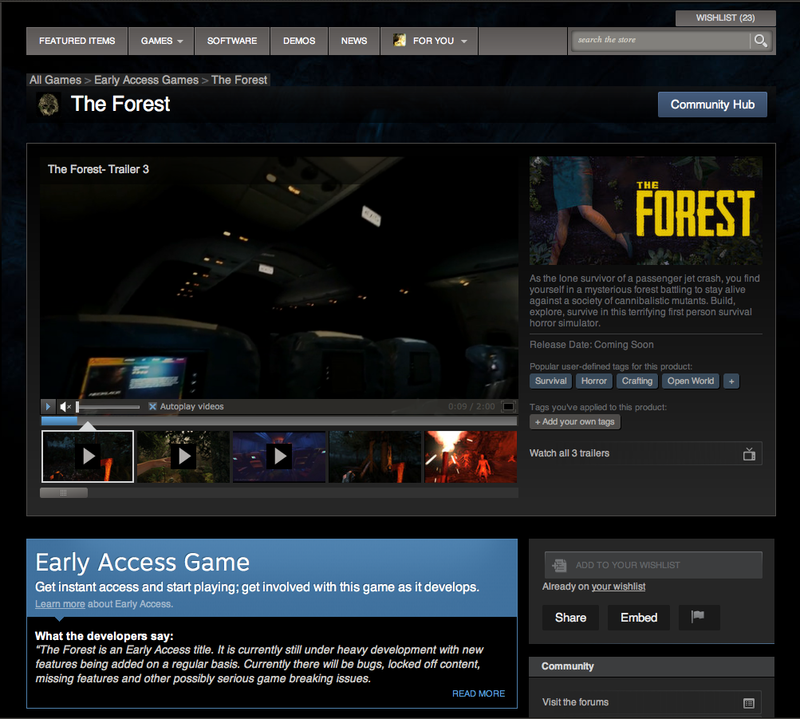 Add 'The Forest' to your wishlist and take part in the new discussion forums. It is with great pleasure that we'd like to announce 'The Forest' now has it's official home on the Steam Store! Come join the community discussion as we count down the last days before launch. The Forest has been in development for a while, but now we need your feedback to make it even better. Our vision for this game is a terrifying open world full of gameplay options and player freedom. We've come a long way but still have a lot of features and improvements to make. Many more animals - fish, snakes, frogs and bird types. We want to really bring the world to life with the variety of fauna. More trapping and hunting options. Expanded A.I. - We're trying some really cool stuff for our AI, and plan to keep it evolving and improving over the alpha. More areas to explore - over time new areas will be added and unlocked and our cave system will continue to develop downwards. More buildable items - More options in what you can construct and what's available to use. More crafting options, more items combinable and more exciting things to create. New creatures - as we unlock more and more of the world and caves over the course of the alpha we'll also be introducing many new terrifying creatures along with a few surprises. Visual improvements - we want to keep pushing what's possible, making the world look, feel and run better. Many UI tweaks and polish. Additional game modes, including a no-enemies cheat mode for players who want a calmer experience. Multiplayer - we find the idea of co-op play in this world really exciting and hope to implement a form of co-op into the experience.